We began our Forage & Feast events some 4 years ago now and they have become such a lovely way for us to mark the seasons and celebrate the changes that take place in Studland and along the coastline here in Dorset. A few weeks back we said hello to Spring on our first Forage & Feast supper club of the year and it was a truely special evening with wonderful company and fabulous food with our guest chef charlotte Pike on hand to help. Here's some snippets and more on the inspiration behind these events. 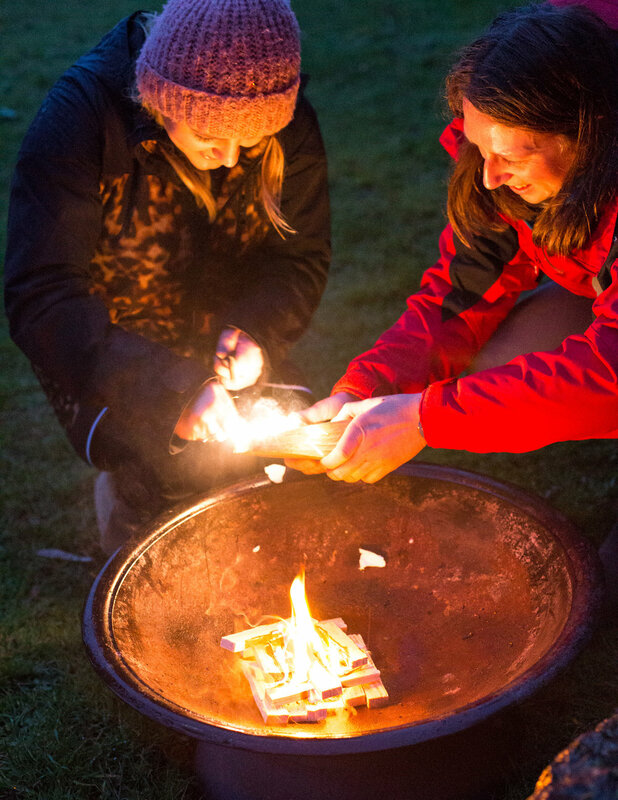 Most of our ideas have come from our own enjoyment of time spent outdoors and how we live as a family and enjoy spending time together outside, our love for food and foraging underpins everything we do and the supper clubs are just another way to enable people who perhaps wouldn’t normally connect with nature to do so in a different way than the normal ‘adventure’ route. On these events we begin with an introduction to foraging, it’s a way of people getting a taster for the subject without committing to a course. We help the guests learn to identify wild plants and teach them how to harvest them and what to do with them, plus share what their medicinal properties are. The walk ends at our feast location, we have a few in the area, some are outside depending on the weather but our favourite is a beautiful pavillion overlooking the sea. Here the guests are welcomed with a wild cocktail and take part in wild food demos with chef and have a go at some simple bushcraft skills. To ensure that we forage sustainably our foragers hold a minimum of a NCFE level 4 in Ethnobotany and plant identification. We ensure that if we take plants that we forage in a sustainable way by only taking what we need and we don’t take from triple SSI sites, the wild ingredients we use don’t make up the whole meal but provide enough for additions to the menu like the sauces, syrups and garnishes. The menu is designed around the seasons and heavily influenced by the wild ingredients that are growing at the time of year, we incorporate some of the plants that we have shown the guests on the walk so that they can see and taste for themselves how they can be used in cooking and take these skills away with them. Being on the coast we regularly use seaweeds and sea vegetables in our menus with the inclusion of hedgerow greens and edible flowers. 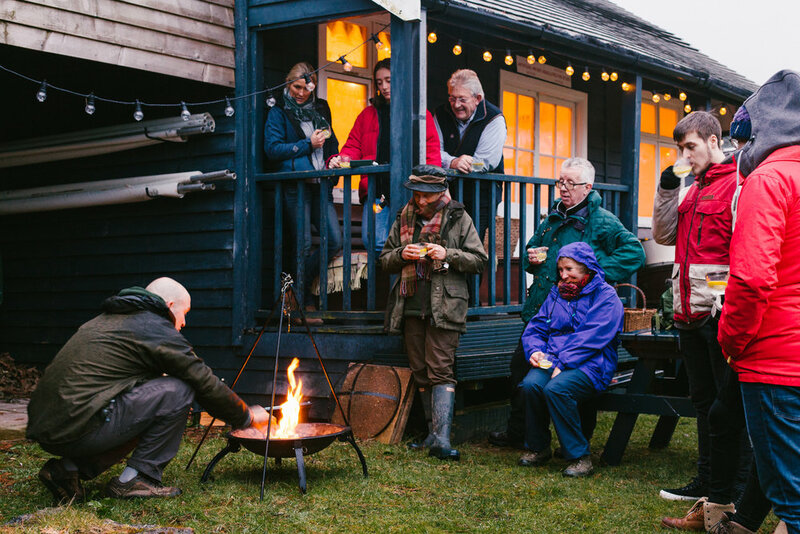 As often as we can we cook on open fires and bbqs, we find that these methods enhance flavour and create a sense of theatre and camp camaradie. The feasts take place at a shared table usually with around 20 guests to keep it intimate, the setting is styled to reflect the seasons and we dine by candlelight. There is always a soundtrack of laughter and shared stories and more often than not new friendships are formed that last longer than the night! We do run various other foraging courses on and off the water and some guests come back to try them all and gain an understanding of seasonality and different harvests plus how the plants can be identified and have different uses throughout the year. Another favourite feasting experience is our signature kayak, fish, forage & feast where we spend the day exploring our beautiful jurassic coast by kayak, fishing and foraging as we go and stopping by Old Harry Rocks to navigate the caves and archways before heading back to our beach base with our ingredients to cook up a wild storm. One experience not to be missed! See our what's on page for our upcoming kayak, fish, forage & feast dates and our seasonal forage and feast supper club. We also run corporate events in Dorset and can host private parties and celebrations, get in touch with us to discuss your requirements. * With thanks to continu-um for the photography.